For the last 5 years CrabCake 2 has been fascinated by The Tour de France. It started with the last of the Lance Armstrong years and has continued on, unabated through rider defections, retirements and doping scandals. Everyday, he wakes up at the crack of whatever and plops himself in front of the TV to watch the race and listen to Phil Liggett and Paul Sherwin announce the day's action. CC2 has become a true fanatic and connoisseur. Now, being middle-aged, to me the Tour is little more than a rolling example of better living through chemistry. Despite organizers' efforts, there is a car-wreck fascination with keeping track of the banished, performance-enhancing-drugged rider count. That said, there is still something mesmerizing about watching over a 100 riders attempt to complete the 2300 mile race. The ultimate moment of the Tour comes in the Alps. The stage, (this year the 17th of 21), is a 130.8 mile race through the mountains, culminating with a 10 mile, virtually vertical ride to the summit of L'Alpe-d'Huez. For most of the last ten miles the thousands of spectators are in no way separated from the riders. As the racers slow, having completed 121 miles of riding, and climb the final ascent at a mere 15 miles per hour, the spectators surround the riders, shouting encouragement or slurs while running along side. Here's what I've observed about the fans. They are almost exclusively white, or pink depending on the depth of their sunburns. They spend a great deal of time with virtually no talent to develop costumes mirroring the colors of their favorite team or home country. They are oblivious to the fact that they may affect the outcome of the race by hitting a rider or being hit by one of the accompanying vehicles in the motorcade. And, while I can't speak to the riders, the fans certainly seem to be juiced on performance debilitating drugs that make their ability to remain upright an athletic accomplishment in and of itself. Stewed white people. Ah, summer in France. Well that roundabout trip brings us to today's recipe. It suffers from a somewhat unappealing name, Stewed White Beans, but don't let that deter you. It's a great side dish for just about any meal. It's also flavorful and nutritious enough to serve to your vegetarian friends as a main course. Amusez vous. In a medium saucepan over medium heat, warm the oil, then cook the onion, garlic and pepper flakes until softened, about 3 minutes. Add the tomatoes and beans, stir well to combine. Season with salt & pepper. Bring the beans to a boil, reduce heat to low and simmer for 15 minutes. Remove beans from heat. Allow to cool slightly and add torn basil leaves. Serve. There you have it. Open a few cans, saute a little bit, simmer some and you end up with a very versatile side dish. Roast or grill something to go with the beans, sit down in front of the TV and watch the race. Vive la France, Vive la Tour. A la prochaine, you can do it, you can cook. yes! i love the tour, in no small part because of phil liggett; i recently wrote a post honoring some of his greatest hits. we were so excited about aple d'huez that we ordered in. Dead on Michelle. Phil Liggett's personality and passion for the event is a great part of why I keep at least listening to the broadcasts. Who else could make a rider taking a 5 foot lead in the Alps sound so monumental? But don't underestimate Paul Sherwin, while Phil is clearly the driver, Paul makes sure they don't go too far over the guardrail. To see how boring the event will be when Phil and Paul move on, watch the late night Versus channel replays with Bob Roll and whatever trolls they seat with him. It's death! This looks great! 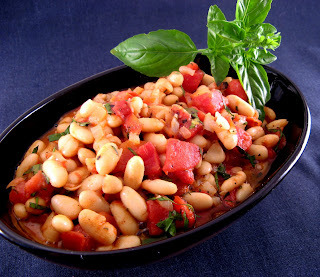 I love white beans and your recipe looks like a great way to use them. Why do you tear the basil leaves? Because it is considered bad luck to cut them with a knife. 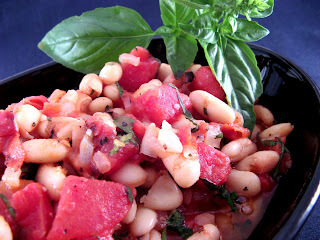 White beans as a side dish with grilled meat is a classic match with Chianti Classico or any other Tuscan red. Yeah, yeah, this is about the Tour de France so any Rhone wine will work too. If you really want to search for a great white wine match and expect to spend $20-30 a bottle, look for a white wine from the town of Cassis, not to be confused with the liqueur Creme de Cassis.